Mauro Gomez probably couldn’t believe his luck when he saw the pitch Chris Seddon threw him. Gomez had been stuck in a brief slump. Naturally, the media contingent that follows the team had been busy overreacting to it for a few days, bombarding the slugger about each and every tiny twitch he made at the plate. So when Gomez stepped into the box to start the second inning on Thursday against the Yomiuri Giants, he might have seen relief, manifested as a small, white ball, coming out of Seddon’s left hand. A first-pitch, 137-kph fastball down the middle. Gomez sent that pitch over the fence in right-center. He singled in two of his next three at-bats. He broke out of his slump, and probably got a few doubters off his back in the process. Gomez hasn’t given the Tigers or their fans many reasons to doubt him this season. His brief downturn — an 0-for-13 stretch, with eight strikeouts, spread across three entire games and part of a fourth — was one of the few blips in an otherwise solid transition into Japanese baseball. The Dominican infielder was hitting .292 entering Saturday’s games and leading the Tigers with 25 doubles, 19 home runs, 83 RBIs and a .506 slugging percentage. He says once his home run total hits 20, he’ll shave off the beard he’s been growing. Tigers fans might ask him to reconsider with the way he and equally follically-endowed teammate Matt Murton have been swinging their bats since growing out their facial hair, reviving memories of famously bearded Hanshin legend Randy Bass, who led the team to its only Japan Series title in 1985. Gomez also began Saturday with a .879 OPS and a very good .383 weighted on-base average, a stat that weighs the different batting categories to reveal a player’s overall offensive contribution. 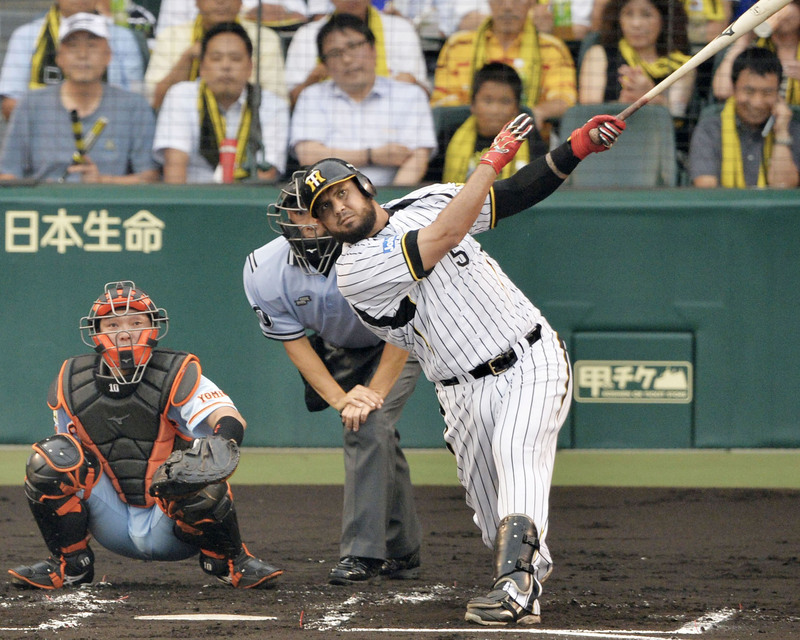 His skills at the plate combined with a genial personality have helped ease the transition in his first year in Japan. “He’s talented, number one,” Murton said. “He’s got a good ability to hit the baseball. I think he’s done a really good job of trying to embrace the culture and just go into the situation here open-minded, and he’s done a really good job trying to adhere to the policies. Before coming to Japan, Gomez had spent most of his career in the minor leagues, save for a brief run with the Boston Red Sox in 2012. He agreed to join the Tigers during the 2013 offseason. Gomez had a somewhat delayed introduction to Japan. He was scheduled miss to the first few days of spring camp in order to be with his family for the birth of his daughter. His arrival was further delayed when his child fell ill and was in the hospital a few days. He had to play catchup when he finally arrived in Japan, and was then further slowed by a nagging injury to his right knee. He got up to speed with the Tigers’ ni-gun team as he prepared for the season. Gomez hit the ground running once the regular season was underway. He had two hits and two RBIs on Opening Night. Gomez went on to reach base at least once in each of the first 27 games of the season, breaking the franchise record of 24 that had been held by Yutaka Wada, the Tigers’ current manager, since 1997. Gomez put any concerns about his spring to bed by hitting .327 with four homers and 33 RBIs in his first month. That start may be the reason Gomez didn’t have to worry about having time to turn things around during his recent struggles. By then, he’d built up considerable equity with the coaching staff, a lack of which has helped sink the NPB careers of some foreign players in past seasons. “I think opportunity is one,” Murton said when asked about the biggest obstacles first-year foreign players face in Japan. “I think that very early on, a lot of times in Japan there are a lot of judgments passed, which is common in life and in sport. But they’re very quick to write guys off or believe that they’re capable of doing something. I think sometimes guys get written off a little too early. “So I think opportunity is a big factor in guys’ success or failure. That opportunity a lot of times comes with, honestly, just the luck of the draw. I feel like for me, Christ allowed me to come out and perform early on in the season, and then it kind of takes care of itself. 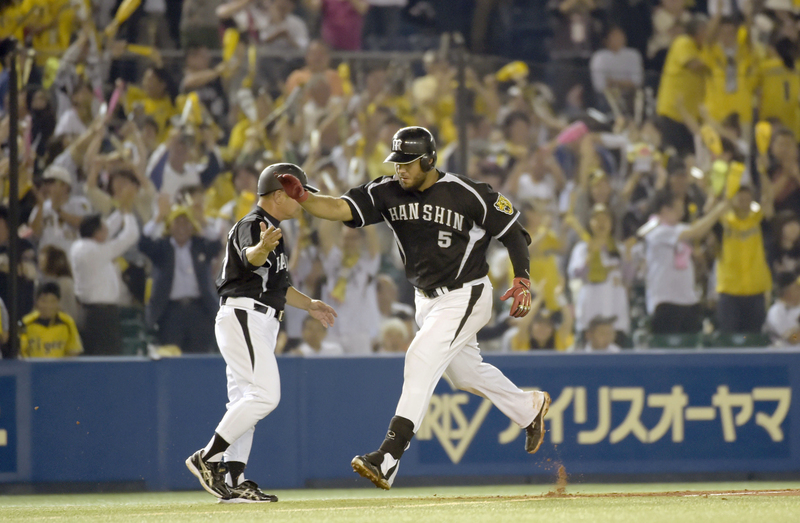 Gomez went 2-for-4 against the Yokohama BayStars the night after his slump-busting performance against the Giants. 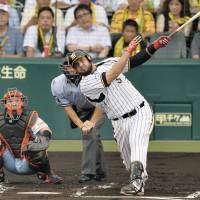 Both he and the Tigers hope his troubles are a thing of the past as the club, which entered Saturday 2½ games behind the Central League-leading Giants, vies for its first pennant since 2005. Gomez said his goal is to, “finish strong, try to do my job, try to help my team finish first, or at least second.